Are you scared to travel with your allergic child? Having food allergies has never stopped this Allergic Traveler from discoveri ng the world. There is so much to see, it would be a shame not to see what the world has to offer. From an early age, my parents instilled the importance of traveling in me. I went on my first trip at the age of two to Florida. My mother and grandmother just went. This was pre-internet, pre-Epi-pen and pre-Benadryl (at least for me.) They were both very brave, but never thought twice about going. Admittedly it was probably easier at that age because I was eating baby formulas, but that did not matter. This was just the first of many trips. I have traveled by planes, trains, cars, and boats. I have seen more than 25 states, 7 provinces and 22 countries. It’s a big world! And I still think there is a lot more for me to see. To help you on your next travel adventure, here are some of my live by travel tips. the cold. If you are headed to a foreign country think twice about microwave foods as they may not always be convenient. Not everywhere has a microwave. 2. 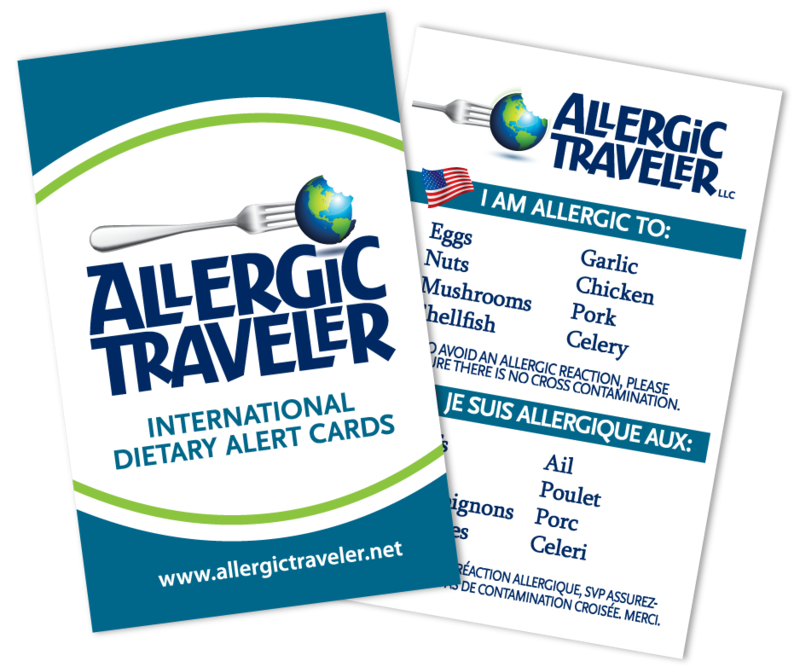 Always have Allergic Traveler cards on you! We produce cards in more than 18 languages, one of them is sure to fit your need. We also have cards in just English, which are our most popular. companion have them carry some. 4. Research where the local hospitals are. follow it. You do not want to have to look for Benadryl in a foreign country because you forgot it. allergies, where you keep your meds and if you have any rituals. 9.If you take a cruise, make sure to notify your travel agent of all your allergies. A lot of cruises are very accommodating to food allergies. 10. Try and always get a room with a fridge; a microwave is just a bonus. Some hotels that don’t have microwaves in the rooms have ones that you can borrow or use. 11. Have fun! This is an experience that you will cherish always. What are some of your tips? Share them with us. Can anyone give me a specific name of a vacation destination/resort/cruise that will strictly accommodate an adult with multiple food allergies? Want to take a family vacation with one adult child who has multiple food allergies (Not nut allergy). She will absolutely not eat if she is not guaranteed that her food is not contaminated by anything she is allergic to, or cooked with the same area/grill/tools as others. Please help. I think our only choice is to rent a house or villa or room with kitchen and make our own. I have a few suggestions, depending on interests of travel of course! I do like frequently travel to places that have kitchens. It makes things a lot easier, safer and cheaper! If you would prefer not to, then here are a few other ideas. Disney- Its always big with all ages. They are VERY comfortable with food allergies all across the Magic Kingdom. Camping- This way they can monitor their food and feel very safe. Canada- Canada has very strict food labeling laws, plus you can easily get around knowing one language. Cruising- I know cruises are getting some bad press lately, but I had a great experience. They had someone assigned to me the whole trip. It was great! Hope this ideas help. Enjoy your travels and tell us all about it when you return. What was the name of the Cruise boat you took with all the good attention ? My friend is super allergic to sooooooooooo many things that we can’t travel together where I would like to go as she wants to cook her own things all the time………..no going out to restaurants etc and its boring for me……………..
We took Royal Caribbean. They were fantastic! They had someone assigned to me for the whole week. Make sure you tell your travel agent and she can set it up in your friend’s file. Good luck! Have fun! Journeys With Heart http://www.journeyswithheart.com is planning just such a trip! I think this will be the first of its kind, where not only are all meals entirely gluten-free and assured to be celiac-safe, but the organizers will specifically make accommodations for any and all special diets and allergies. It is so exciting! The trip they are planning is a Riverboat Cruise along the Danube, from Prague to Budapest. As the author of allergy-friendly YUM: plant-based recipes for a gluten-free diet, I will be doing food demos on the cruise. There will also be an excursion in Vienna where the acclaimed Wrenkh Brothers will be offering a gluten-free cooking class as well.